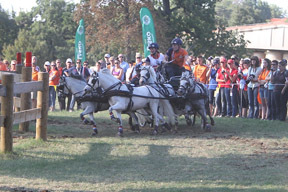 Eighteen-year old Bram Chardon (NED) won the four-in-hand category at the FEI World Driving Championships for Combined Ponies 2011. Photo by Rinaldo de Craen. Three new world champions were crowned at the end of four wonderful days of competition at the FEI World Driving Championships for Combined Ponies in Lipica, Slovenia. Bram Chardon from The Netherlands won gold in the four-in-hand pony class, Dieter Baackmann from Germany was declared world champion in the pony pairs class and Kristina Klindt from Denmark is the new world champion in the pony singles class. Germany were untouchable from the very beginning and took the team gold. Young drivers took the medals this weekend just as was the case a month ago at the FEI World Pairs Driving Championships in Conty (FRA). A new generation of drivers has successfully entered combined pony Driving at the highest level. With 18-year-old Bram Chardon and 23-year old Kristina Klindt winning the gold medals and many other young drivers taking the top placings, the future of pony Driving is looking bright indeed. Bram Chardon (NED) is following in his father’s footsteps. This was the championship debut for the son of four-time world four-in-hand champion IJsbrand Chardon. It did not come easy for Bram though. After placing fifth in Dressage, he won the marathon by driving his team of grey Welsh ponies fast and smooth through the eight spectacular marathon obstacles. Bram took over the lead from Germany’s defending world champion Tobias Bücker who had won the Dressage. Bram had one ball in hand going into the final obstacle driving competition but proved to be a true champion and drove a magnificent double clear round, securing his first ever gold medal. Bram’s fellow team member and 2007 world champion Jan de Boer won individual silver and the 2009 world pony pair champion Daniel Schneiders (GER) made an excellent debut in the four-in-hand category by winning the bronze. Germany’s Steffen Brauchle was on silver before the cones but dropped to the fourth place after incurring some time penalties in the final competition. Dieter Baackmann (GER) set the basis for his gold medal from the very beginning. He impressed the judges with his lovely pair of German riding ponies and took the lead after Dressage, challenging his fellow competitors to beat him in the next phases of the competition. Ewoud Boom from The Netherlands won the marathon but Baackmann remained in the lead. After his compatriot Stephan Koch incurred time penalties at the difficult obstacle driving course, Baackmann’s lead became even more comfortable. Baackmann drove a very strong round and the few time penalties did not endanger his first world champion title. Stephan Koch took the silver medal and the bronze went to Johann Weitlaner from Germany who moved up from eighth thanks to a nearly faultless cones round. There were many very proud fathers in the stands in the wonderful arena at the Lipica Stud Farm on Sunday. IJsbrand Chardon enjoyed the success of his son Bram; Jozsef Dobrovitz (HUN) watched his 19-year-old son Jozsef Dobrovitz junior win the obstacle driving competition in the four-in-hand class. Michael Freund (GER), who was the trainer of the US drivers at Lipica, kept an eye on his 15-year-old son Marco who successfully completed his first world championship placing fourth in the pairs class. Another proud father was Danish international pair driver Kurt Klindt. His daughter Kristina won the gold medal with her Lipizzaner gelding Pluto Callisto. Kristina started with the sixth place in Dressage, which was won by her compatriot and 2007 world champion Peter Koux. In the marathon it was Maxime Maricourt from France who set the fastest time with his super pony Judo. Although Kristina finished sixth in the marathon, the differences were so small that she moved up to runner-up position, just behind Dennis Schneiders from Germany. After a clear round in the cones, Kristina put the pressure on Dennis. The brother of four-in-hand pony driver Daniel Schneiders was unfortunately not able to stay clear and left the arena with 8,65 penalties, which took him down to fourth and let Kristina win the gold medal. Sweden’s Susanne Ankermark moved up to silver. The bronze went to the 2005 world champion Suzy Stafford (USA). The German team started off strong in Dressage and kept their lead throughout the competition. It was composed of six men, while the bronze US team was women only. The silver Dutch team was more emancipated with both male and female drivers on the team. The fifth edition of the FEI World Driving Championships for Combined Ponies was remarkable. The amazing site of the Lipica Stud Farm with its hundreds of Lipizzaner horses, the beautiful landscape and the friendly, helpful and professional organisation made it one of the most successful editions to date. The complete results of the FEI World Driving Championships for Combined Ponies 2011 are available at this link.